Abba Hillel Silver was born Abraham Silver on January 28, 1893 in the Lithuanian town then named Neustadt-Schirwindt and now called Kudirkos Naumiestis. From 1740 until the Holocaust the town was home to an organized Jewish community with many prominent rabbis and scholars. See larger map. He was the fourth of six children born to Moses Silver and his wife Dinah. The Silvers lived as Russian subjects. Lithuania did not re-establish its independence until after World War I. His father, grandfather and great-grandfather were ordained rabbis. But as there was no need for another rabbi in their small town, his father Moses Silver ran his father-in-law's soap business. Moses Silver was a Zionist and also spoke Hebrew, passing on both interests to his son. Moses Silver emigrated to New York City in 1899, worked as a poorly-paid Hebrew School teacher and lived apart from his family until he could save the money for their passage to America. The Silver's youngest son died of pneumonia soon after Moses' departure. 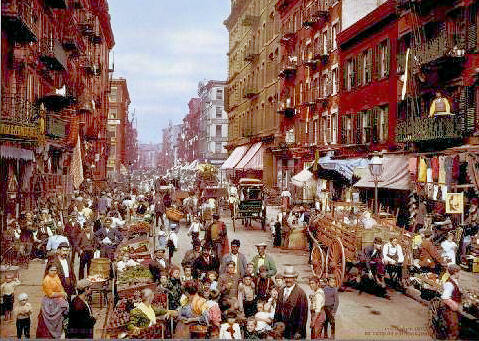 Bessie, the 13 year old oldest daughter, came to New York in 1901 and lived with relatives on the upper East side. 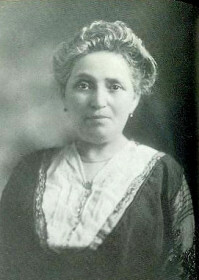 In 1902 Dinah Silver with Abraham and the other three children came to New York. 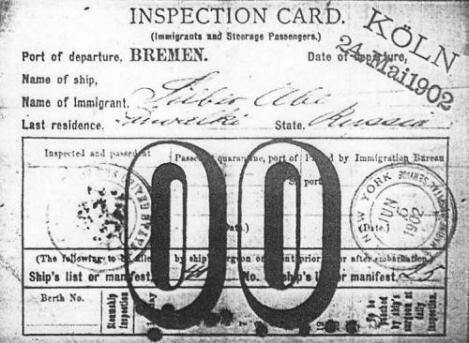 We show his boarding pass, with his name "Abe Silber" (or "Zilber") and arrival in New York on June 6, 1902. The family, reunited after three years, lived on the Lower East Side at 360 Madison Street (see map). Zionism, an extraordinary devotion to the creation of a Jewish State in Palestine, marked Abba Hillel Silver's youth. He showed the activism. energy and eloquence that would become hallmarks of his later life. To learn more, see Dr. Rafael Medoff's biographical essay. For more on his childhood and youth, see Raphael, chapter 1. His father, Rabbi Moses Silver, grief-stricken on the death of Theodore Herzl, suggested to his sons that they start a Hebrew-speaking Zionist youth group. Thus the Herzl Zion Club was born. 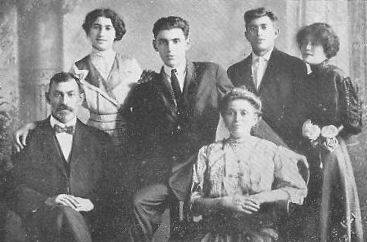 Its members included Maxwell Silver and a younger boy Barnett Brickner (who in 1925 would become rabbi of the Euclid Avenue Temple). 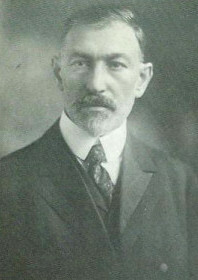 Silver spoke at the 1907 Zionist convention in Tannersville New York, where he was the only youth present. Young "Abe" Silver's leadership of the Dr. Herzl Zion Club suggests that the family continued to live in the Lower East Side until 1908 when Raphael (9) reports that the family now lived at 1488 Fifth Avenue. Like many others the Silver family had left the crowded Lower East Side and moved north to Harlem for lower rents and newer housing. By 1910, when Silver was 17, his family had moved to another location in Harlem 232 (now 232-6) West 120 Street. See the census record below. For photos of this home, click here. On April 28, 1910 the U.S. census taker recorded the information on the Silver family of seven living at 232 West 120th Street, just west of Seventh Avenue. See map. More on Harlem. Maxwell (19) who was attending H.U.C. Abraham H. (17), about to graduate from high school. Rose (11), who does not appear in the family photo taken the next year. All are listed as born in Russia with Yiddish as their mother tongue. In a column not shown above Bessie has no employment noted and Pearl is shown as working in a neckwear factory. Raphael (3) states that both young women worked at home making neckties, such at-home piece-work being very common for those times. Abe would deliver those neckties. "Abraham H." would become "Abba Hillel" while at Hebrew Union College. To view the full census sheet, which is about two screens wide, click here. Dial-up visitors: the 340Kb image will take almost two minutes to display. and parents Moses and Dinah.